Every week we’re asking our summer interns to share some thoughts and responses to various experiences and readings. 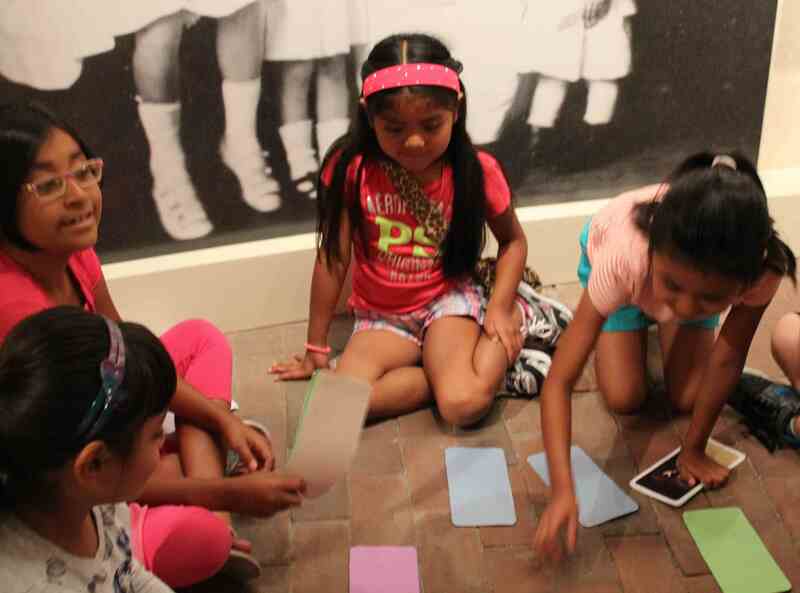 This week we asked them to think about JMM’s exhibits and to share something that has stayed with them. Since starting last week, I’ve had the pleasure of spending a good deal of time exploring the Jewish Museum’s three current exhibits. It’s been interesting to look at them through the lens of a visitor, interacting with the exhibits and learning from them, as well as through the lens of an Exhibitions Intern, thinking critically about why certain aspects of the exhibits are the way they are, what could be improved, and what I think works really well- and so much of it works really well! Like the white coat, the stethoscope is another symbol that marks a person as a doctor, as well as lends the person medical authority. I found this question particularly interesting. Clothes can be so important in helping to construct our identities, both how we view ourselves and how others see us. As another sign mentioned, patients “can find the garment’s symbolism intimidating,” even causing their pulse and blood pressure to speed up when a doctor in white comes into the room! The coat is a symbol of authority, representing years of education and training. I tried on the coat, but mostly just felt silly; after all, I hadn’t even completed my undergrad, much less done a residency. It felt fraudulent! Trying on the coat, and feeling like a phony. I also started thinking about the way I dress, and what I try to convey to people when I do. My current position as an intern has definitely been affecting the way I dress here at the office, with my clothes being more modest and a touch more professional than I usually wear in the summer. At the same time, I still put in effort to make sure the way I dress reflects my sense of style, which in turn is an attempt at reflecting my personality. The notion that objects can express our identities reinforces for me the importance of museum collections; there’s so much to gain from examining personal items more closely, and seeing what stories they have to tell. 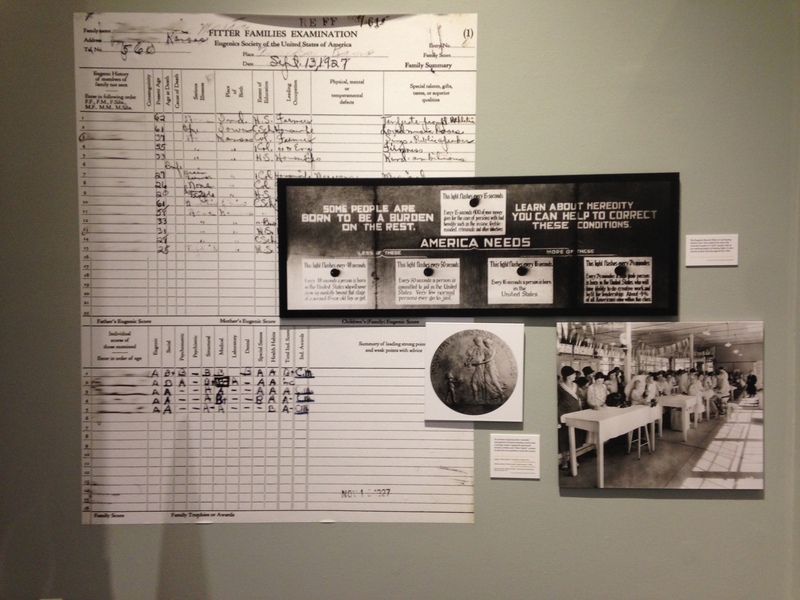 One of the coolest exhibits here at the Jewish Museum of Maryland is Beyond Chicken Soup: Jews and Medicine in America, a fascinating look into how the field of medicine has shaped the identity of Jewish-Americans in both positive and negative ways. One particularly striking piece of this exhibit is the section on genetics, which is especially thought-provoking because of all the significant ethical dilemmas that have surrounded this issue. For instance, the section begins by discussing eugenics and the toxic, malicious racism inherent in that movement that culminated in such a horrific episode in history, the Holocaust. 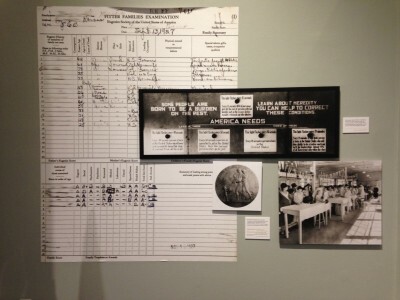 Seeing the actual eugenics ads and testing slips is a powerful reminder that this wasn’t just a line in a history textbook; that it happened, and that it could happen again as we push genetic testing further and further. 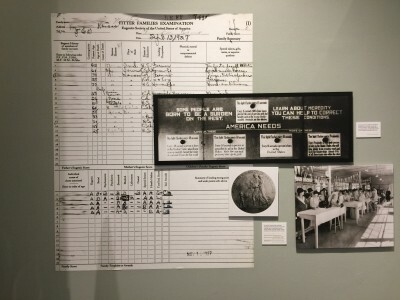 However, this section of the exhibit also later shows how genetic screening helped control and prevent Tay-Sachs disease within the Jewish population, a considerably valuable use of this science. 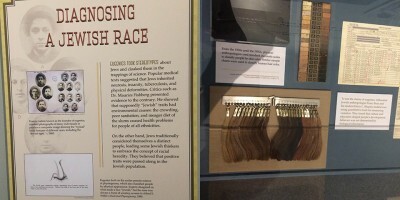 I think that these two examples together are a compelling dichotomy of ethics and that this section of the exhibit really does a great job of showing how the history of genetic screening has been both catastrophic and beneficial to even just a small segment of the US population within the span of a generation. DNA and genetic screening are still fairly controversial and developing fields in the US now, and learning about the history of the societal impact of this science is, in my opinion, very important for moving forward with this technology. 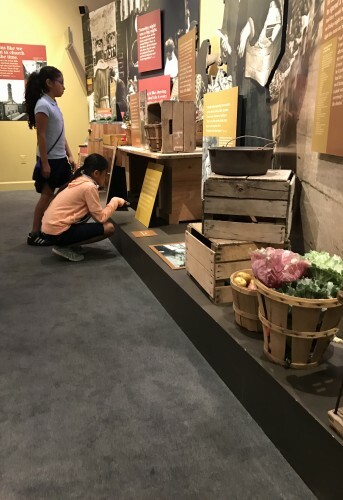 The exhibits of the JMM each offer a unique perspective into telling the story of the Jewish community in Baltimore and how that history has been created. The exhibit that stuck out to me the most is the Synagogue speaks exhibit, despite it being the one I have spent the least amount of time in. It showcases the problems of having a building with a long history and trying to decide which part of that history to highlight. 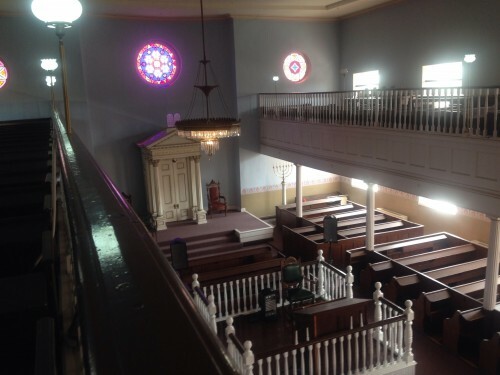 The upper part of the Lloyd Street synagogue has been renovated to look as closely as possible to the way it did at the time of its founding in 1845. This of course meant that much of the more recent history of the synagogue had to be removed, elements like a pipe organ and a painted ceiling. This problem is partially reconciled in the basement where the exhibit Synagogue speaks is housed. The basement was excavated in the 1990s exposing the multiple layers of the museum. Some sections, such as the matzo kiln look as if excavation ended only a few days ago. There are beams exposing the construction of the walls, reminiscent of the Schiferstadt Architectural Museum in Frederick. In the mikvah area, where it would be unsafe to leave area open and unfilled, they instead placed excavation photos over the floor so visitors can see what lies below. The exhibit also shows the deferent eras of construction through exhibit boards with photos, and video screens. As an archaeologist myself, I appreciate being able to look at what the excavation findings were and how they fit into the context of historical documents. It is also useful to see how the museum chooses to display archaeological artifacts. There is a small display in the center of the exhibit across from a screen showing a slideshow of the various changes to the museum over time. The objects are not the most complete but show the type of objects common in historical excavations, such as pieces of larger ceramic pots, and various glass bottles. Before sealing off the various areas in the basement during past renovations, debris probably found its way into those areas, maybe placed intentionally to help fill in features, such as the mikvah which had been filled in with cement. A piece of the fill cement from the original mikvah is on display showing artifacts still stuck in the cement. I have spent about a week in the JMM’s internship program so far. 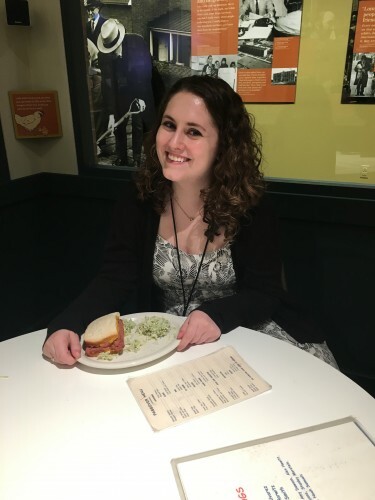 Through my time in this internship I have learned a good deal of new interesting facts about the Jewish community in Maryland and the beginning of the Jewish migration to the United States. Synagogue speaks gave an interesting insight into the various waves of Jewish migrants giving an insight to the reasons for the migrations. More importantly it defined the differences in origin and religious beliefs that these Jewish immigrants felt both in their home countries and once they settled in the United States. This was continued in the exhibit Beyond Chicken Soup which gave even more insight into how these immigrants settled and what roles they filled in society, a prominent theme being the Jewish community filling the relatively new and expanding field of medicine. The exhibit relates the early interest in medicine stemming from certain religious principles of cleanliness and healthy body maintenance. One particular section of Beyond Chicken Soup really struck my interest was the work in Eugenics from the Jewish medical community. Up until that point I had always associated Eugenics with a very hostile connotation as it was used as a justification to harm millions of Jewish people in Europe and minorities in the United States (among other places). It was eye opening to see that Jewish interest in Eugenics predated the Nazi’s interest in the subject; I was even more surprised that there is still a degree of interest in finding a genetic trend that makes the Jewish community unique. Overall all the exhibitions had a section that caught my interest in some way. While walking through the Beyond Chicken Soup exhibit, I took notice of the objects and panels drawing attention to the ways the world of medicine uniquely acted upon Jewish people more than anything else. The idea that antisemitism had such a concrete effect on the treatment and health of Jewish people was fascinating! Most of all, I was drawn to the small section on eugenics. A chart that evaluates subjects’ eugenic “fitness” and a graphic that reminds the reader that some people are genetically destined to be burdens. The practice of eugenics affected the lives of many minority groups in America, but I had never considered how Jewish people might have factored into it. I didn’t realize that antisemitism was so entrenched in the American psyche that people could openly considered Jews to be biologically inferior. Eugenics shows how much harm science and medicine can do when it is practiced by deeply prejudiced people, and that idea has stayed with me ever since I visited Beyond Chicken Soup. 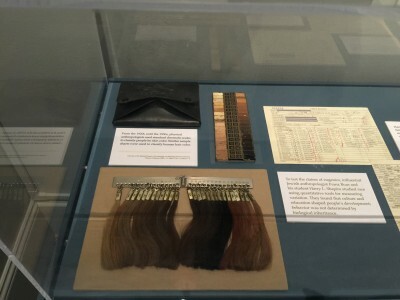 Hair and skin swatches used to classify subjects. After having completed about two weeks of the JMM internship, there are many valuable lessons that I have learned. Yesterday, I was lucky enough to make the acquaintance of Betsy, who is an absolute to, and who has many words of wisdom. This is just to show the kinds of experiences that can be had here. I was also sorely disappointed by the flag house, and on Flag Day of all days. A scholarship that was meant to honor a woman of color who was an indentured servant, was given to a white male student, who frankly had little to say about the hardship she must have endured in her life. He said that she was lucky, and should have felt blessed. I think she should have been angry, because I’m angry. I’m angry that the award was given to a white male student from one of the wealthiest counties in the country, when it should have been given to a woman of color from one of the state’s most destitute. I’m angry that nothing was said in the student’s few-sentence long speech about how the issues of that time tie together with the similar issues that we still face today. And I’m angry at the self congratulatory ceremony held at the flag house, which was attended by almost exclusively white people, and their apparent apathy to the major issues regarding inequity in our city, which is one of the most segregated in the country. In comparison, the Jewish Museum of Maryland is dedicated to the mission of equality in our city, of which I am quite proud to be a part of. 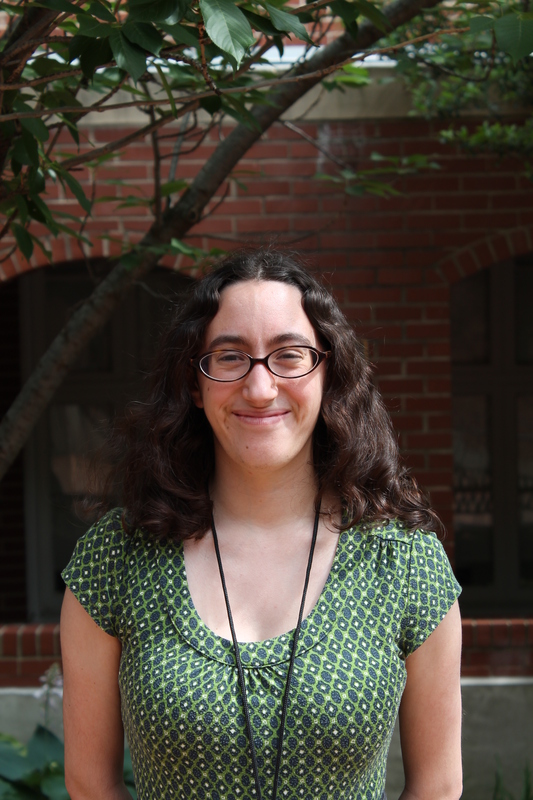 As a historically oppressed people, we know the importance of standing up for all else who are oppressed, and realize that our mission, to preserve the historical narrative of the Jewish community in Baltimore, is actually one and the same as fighting for equality and justice in our community to day; not just for Jews, but for all oppressed people. As Jews, who have experienced much prejudice and institutional bias and apathy in the past, it is imperative that we consider its defeat as primary a focus as ours as a historical archive. One of the exhibits that has truly spoken to me so far is Voices of Lombard Street. 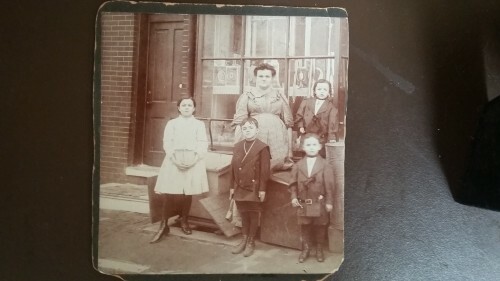 My family has been in Baltimore ever since they came to the United States. My mother has passed on her love of Charm City to me, hardly a day goes by where I don’t learn an interesting fact about Baltimore. The exhibit is practically a physical representation of my mother’s childhood. One of four daughters, my mother grew up seeing Baltimore develop into what it is today. I can almost hear my grandmother talking about her childhood when I walk around the exhibit. Baltimore has acted as a historic location for Judaism in America. 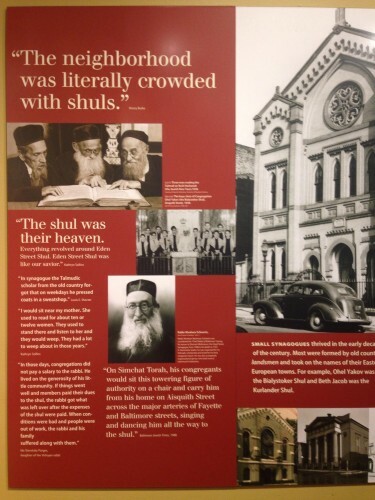 With a multitude of synagogues, a large Jewish population and a rich history, the Monumental City is a natural topic for anyone interested in American Judaism. 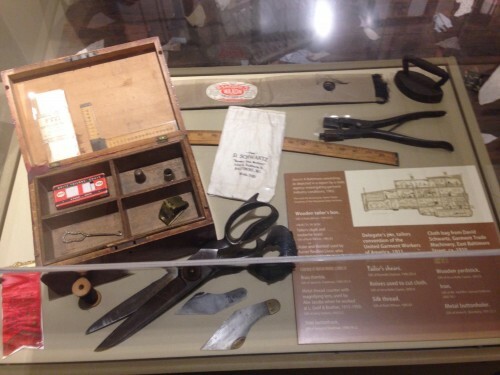 The artifacts pay homage to the hardworking men and women who lived in Baltimore city. 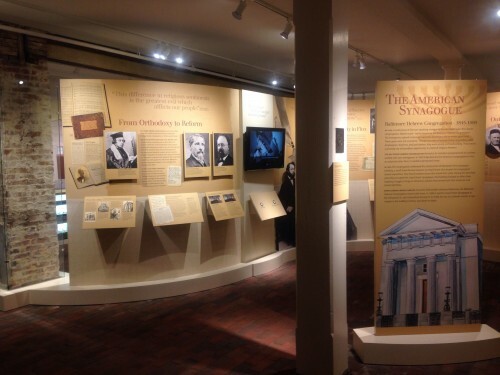 Anyone who enjoys Baltimore history should check out the informative and interactive exhibit that the JMM is hosting! 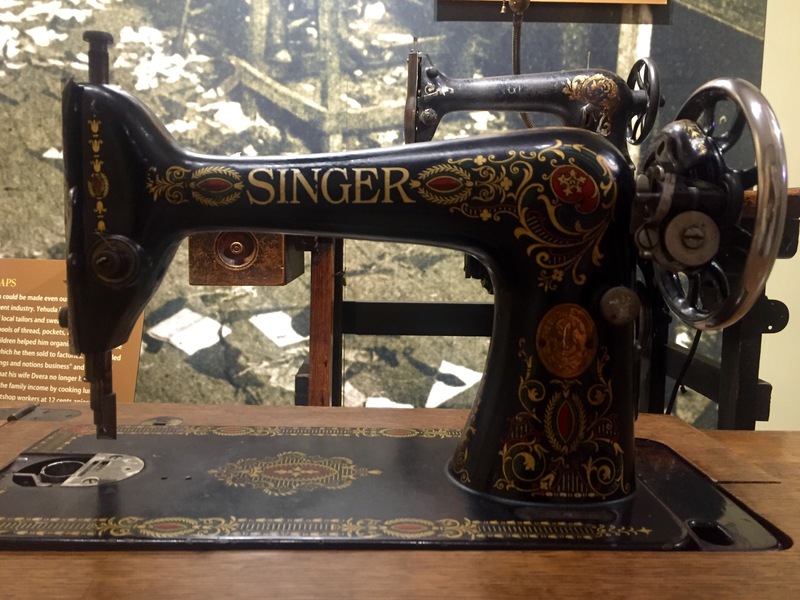 Of the three exhibits what really caught my eye were the sewing machines in Voices of Lombard Street. At first I was unsure why it did, so I did not give it much thought, but every time I went into the exhibit I realized I always lingered a little longer in that room. The neutral tones, the pink, grey and black scraps of fabric, the design on the sewing machines, it all made me think about women and their experience during this time on Lombard Street. 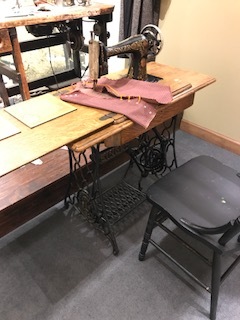 In the exhibit that area discussed sweatshops and workers of both sexes, but sewing has always been associated as a feminine skill, therefore, as a woman I feel a connection. 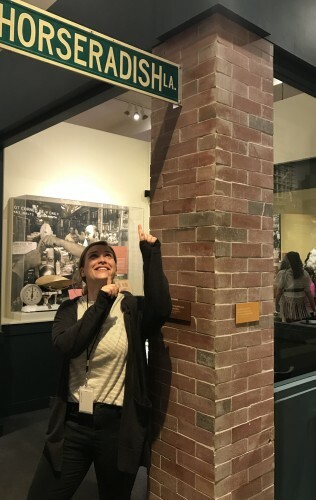 When we discussed in-depth with Karen Falk about our experience in Voices of Lombard Street, I suggested that the exhibit felt a little creepy, yet homey. While these two feelings are in complete opposition to one another, the combination of antique items, blasting air conditioning and the “old smell”, gave me the feeling of nostalgia mixed with feelings of hope. To clarify, reading about the history and being in a place that represents it makes me have a greater appreciation for what women (in my case) had to go through and an even greater appreciation for where we are today. A lot more work has to be done, but the voices will always be heard. In many museums, I’ve seen signs tacked up on exhibit walls simply reading, “Think” or “What would you do?” These vague phrases supposedly encourage the visitor to reflect upon the exhibit or place it into the context of her or his life. However, in Beyond Chicken Soup, JMM goes a step farther. In the middle of the room covering eugenics and genetic diseases, there’s a touch screen that asks thought-provoking questions and offers complex potential answers. One asks, “Would you get tested for a rare genetic mutation that doesn’t affect your health, but could be passed on to your children and make them sick?” with answers such as “Yes, but only for fatal conditions like Tay Sachs” or “No, I’d rather not know if a carry a mutation. I would have children anyway.” Another simply asks, “Who should get screened?”, offering “People from ethnic backgrounds where the BRCA mutation is more prevalent,” as a potential answer. 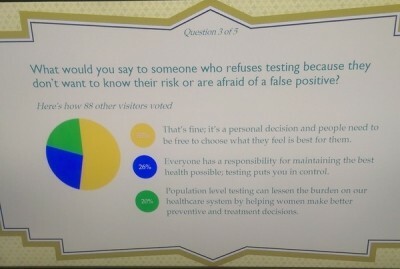 This isn’t the only touchscreen questionnaire in the exhibit, and none of them shy away from difficult and controversial questions and answers. After clicking on your choice, it shows a pie chart breaking down what other visitors answered, sometimes to my surprise. I’m always looking for relevance in historical facts, for the aspects of them that speak to human nature at anytime or anyplace. 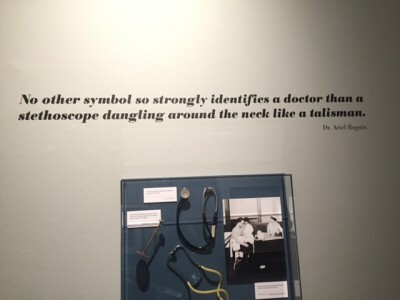 I love that the Beyond Chicken Soup exhibit explores this and reminds the visitors that the same questions that arose when genetic testing first emerged remain relevant and complicated today. I hardly knew my answer to any of the questions asked, not even between the two extremes. By non-judgmentally laying out both sides as equally legitimate options, I saw the benefits and detriments to each answer. I hope to see more museums applying these tools in the future! In the most recent exhibit here at the Jewish Museum of Maryland, Beyond Chicken Soup, there is a large cabinet in the pharmacy section. It is filled with historic medicines and remedies and helps give the feeling of an actual pharmacy. However, this cabinet is more than a creative display case. If you look closely, the bottom drawers invite you to open them and look inside. 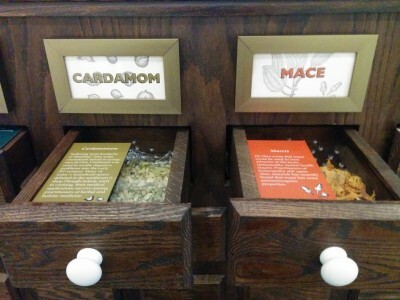 There, you will find different smells that would have been associated with the pharmacy: one drawer has cardamom, the next has mace. Believe it or not, these spices were once used to treat patients. They are accompanied by instructions in how they were used and what they were thought to treat. 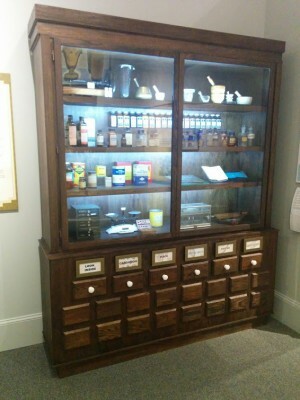 This cabinet gives visitors a chance to transport themselves back to the early 20th century pharmacies. Because pharmaceutical schooling was less expensive, less discriminatory, and less time consuming than medical school, it was less complicated to become a pharmacist than a doctor. Nevertheless, these pharmacies became essential centers of community health. 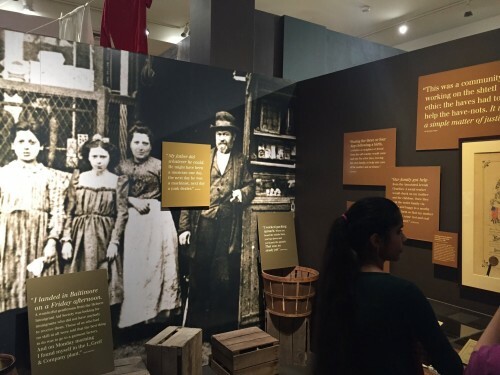 This is not the museum’s only interactive exhibit, but it does a unique job of blending the display of collections with the public interaction component. Sliding open the drawers gives the visitor a greater connection to the early 20th century pharmacy that cannot be achieved by a touchscreen questionnaire. As museums move into the future, I worry that we will lose elements like this. While it is important to move forward and keep up with the world around us, it is just as important to remember the past. The digital age is convenient, but the 20th century pharmacy is community. Interactive exhibits like this keep us grounded, and for that I am grateful. To read more posts by and about interns click HERE. One of my favorite things that I’ve done during my internship here has been creating and leading activities for elementary and middle school students. Most of the activities I’ve worked on are connected to The A-Mazing Mendes Cohen exhibit opening in September, but I’ve worked on two that kids have had a chance to try out. For the first activity I was tasked to create, my co-intern Arielle and I were given a bunch of cards with Jewish and Christian symbols on them that are usually kept in The Synagogue Speaks exhibit. Since there were multiple cards with each symbol, we decided the best way to teach kids about the symbols on the cards would be to create a matching game. 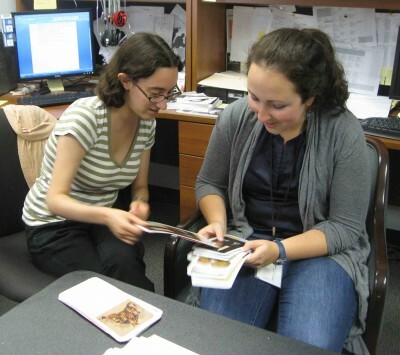 Museum Education Interns Emma Glaser and Arielle Kaden discussing which cards should be used in the matching game. Eight pairs of cards are placed randomly in a 4×4 grid and the kids playing the game have to take turns turning over cards until they’ve found all of the matches. It’s especially fun toward the end of the game when they know where some of the cards are and give advice to their friends on which card to pick. Once they’ve found all of the matches, the staff member with them asks the kids which symbols they think are Jewish and which are Christian and discusses what the symbols are. Some of the symbols used in the game are Shabbat candles, a nativity scene, and a yarmulke. The game works best for groups of five to fifteen kids per grid, so it’s a great opportunity to for kids to have a group discussion and ask questions. 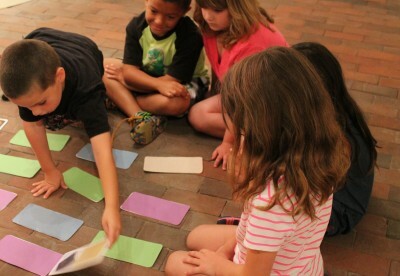 Kids from Hampstead Hill Camp playing the matching game. The other activity I created is based on The Electrified Pickle exhibit. It’s a scavenger hunt that’s aimed at getting the kids interested in the artifacts in the exhibit. The scavenger hunt highlights one interesting artifact from each section of the exhibit. 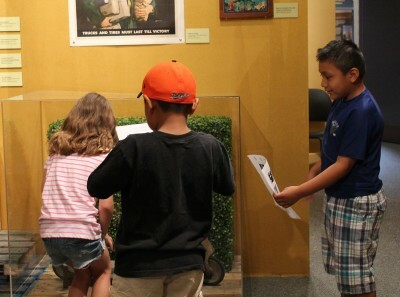 When I was creating it, I picked artifacts that I thought would draw kids’ eyes, either because they were striking, like the samovar used in the exhibit, or because they were something the kids would have used themselves, such as a scooter. Considering which artifacts to include in the scavenger hunt. 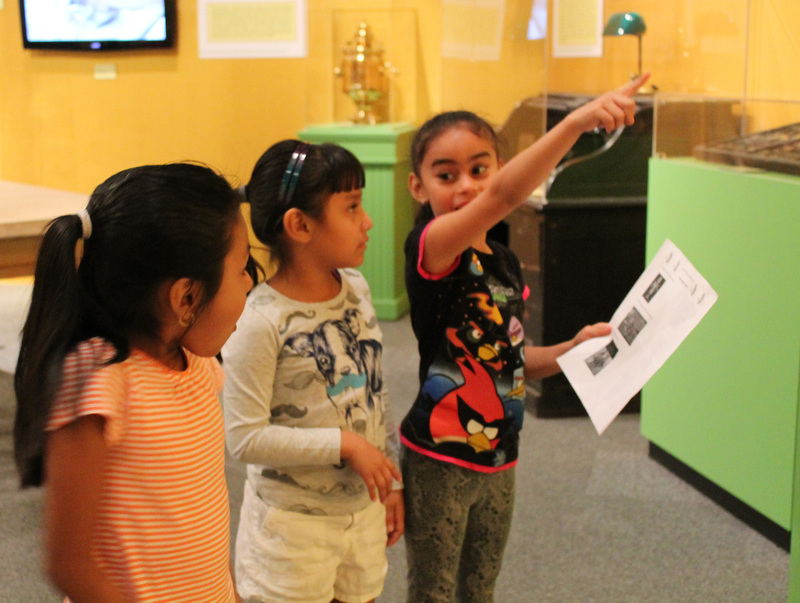 Kids have to find each artifact pictured in the scavenger hunt and figure out what it is. 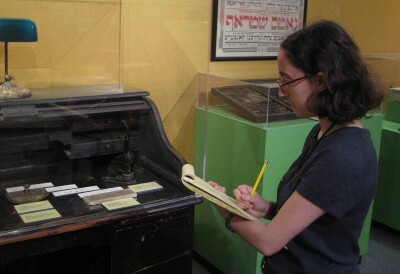 Older children also have to find the answer to a question about each artifact, such as what its function was or when it was used. At the end of the activity, a staff member asks the kids what the answer to each question is. A girl from Hampstead Hill Camp points out an artifact to her friends. Three kids from Hampstead Hill Camp check out a scooter they found in the scavenger hunt. 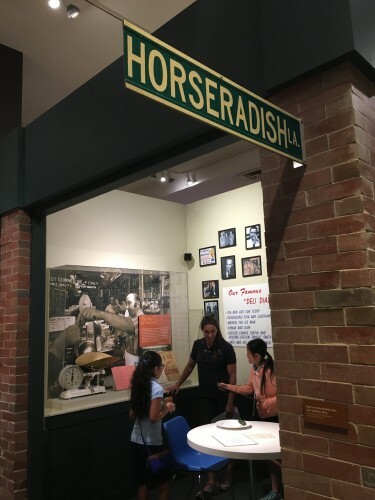 I have really enjoyed leading activities for kids here because it is very rewarding to see them enjoying and learning from the exhibits here at the museum, and that is doubly true for the activities that I created. 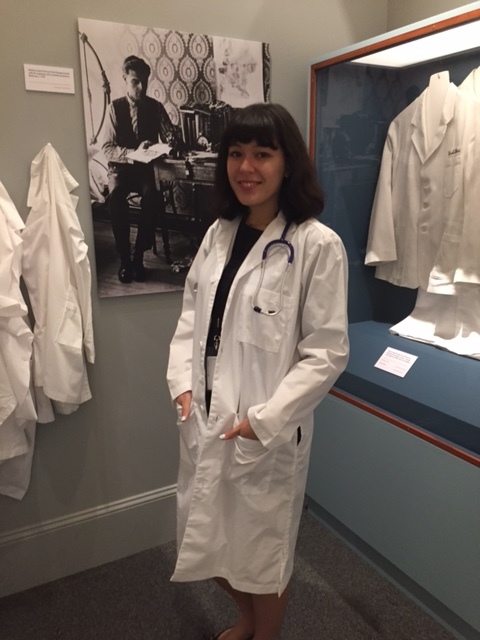 A blog post by Education Intern Emma Glaser. To read more posts by interns, click HERE.